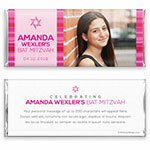 Bright vertical stripes, a delicate Star of David and a large photo feature on this modern Bat Mitzvah design. Design: Vertical pink stripes with Star of David detail and photo. Personalization: Front photo and and text with back message. Recommended Photo Size: 844 W x 769 H pixels.